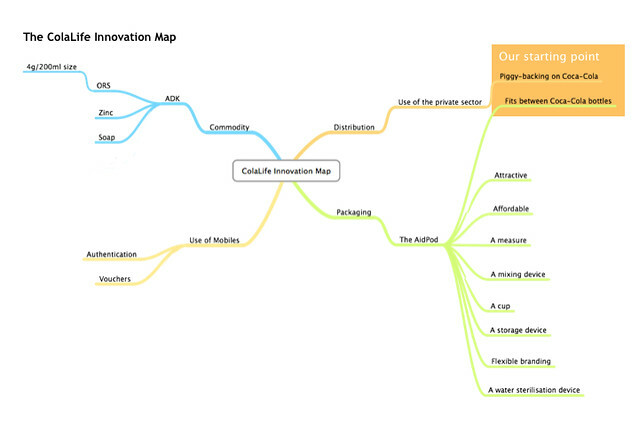 I have written about the ColaLife Innovation Map before but it is time for an update. 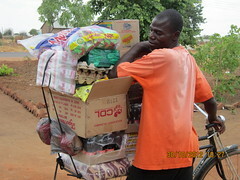 Now we haven’t strayed to these extremes but we have come a long way from our starting point of physically piggy-backing on the Coca-Cola distribution system by making use of the unused space in a Coca-Cola crate to carry anti-diarrhoea kits. There have been 4 main areas of innovation. Let’s look at them one by one and see where the REAL innovation lies. This was our starting point and this is what has captured people’s imagination. The idea that Coca-Cola gets everywhere but essential medicines don’t and that these medicines could hitch a ride in Coca-Cola crates is a very powerful one. So we went for it. Having designed a few cardboard prototype ‘AidPods’ ourselves we handed the task of designing a pack that would work in the real world over to our packaging partners PI Global. PI Global came up with an iconic pack that looks fantastic and fits between the necks of crated bottles beautifully. But is this the real innovation? Probably not. 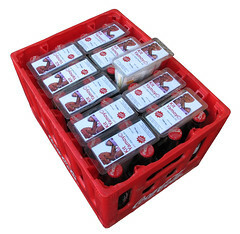 In the first six months of the ColaLife Trial (COTZ), retailers have bought more than 20,000 kits and very, very few retailers have actually put our Kit Yamoyos into Coca-Cola crates. It turns out that making use of unused space it not the key enabler we thought it might be. The key thing is to mimic Coca-Cola’s marketing and distribution systems to get our kits to the same places Coca-Cola gets to. This is explained in this blog post: It’s the value chain stupid! 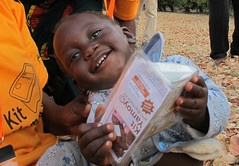 We started with the need for our Kit Yamoyo anti-diarrhoea kits to fit in Coca-Cola crates. This meant that the packaging got a lot of attention. Under more usual circumstances, you decide what to distribute and then decide what to distribute it in and the answer is normally a cardboard box. A cardboard box would not work in our case. 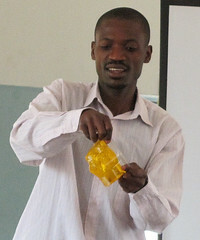 During this intense focus on the packaging we looked at options for recycling and re-use. This thinking led to the idea that the packaging could not only hold the kit components in transit but could also act as a measuring device for the water required to mix the ORS, a mixing device, a storage device and a cup. During the design process we talked to mothers about the challenges they faced using ORS and the correct measurement of the water was a key issue. This focus group observation is now being backed up by the data coming in from our midline survey that indicate that mothers, who are not using our kit, only mix ORS correctly about half of the time. So is this the innovation? It’s definitely part of it . . . please read on. Another key outcome of our initial focus group work with mothers was that 1 litre sachets were inadequate for the home treatment of diarrhoea. 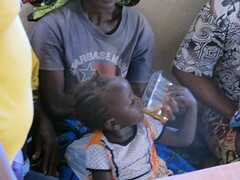 1 litre is too much for a single child and the solution that is not consumed within 24 hours should be discarded. Mothers know that a litre is too much and don’t throw things away. So what happens is that they sprinkle some ORS into an indeterminate amount of water. 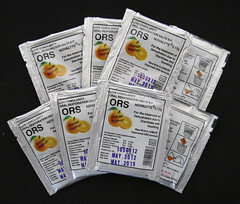 This means that the ORS solution is likely to be too weak to be effective or too strong to the point that it may cause osmotic diarrhoea and make the situation worse. So we went off-piste and diverted from our original plan of including two of the standard 1 litre sachets in our kit and started looking for a local pharmaceutical company who might be willing to make up smaller sachets. Fortunately we found Pharmanova. The full story behind this brave decision, made a couple of months into the project, is here: Going off-piste! 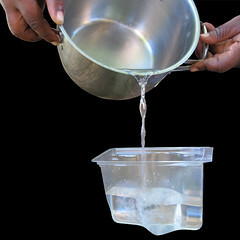 This decision coupled with the use of the packaging as a measure for the water is a big break-through we think. Now people, myself included, get very excited at the potential of new technology to be a game changer. All the excitement around mHealth is testament to this. We have used vouchers in the first six months of the project to launch Kit Yamoyo – a completely new product – in our target communities in remote, rural areas. 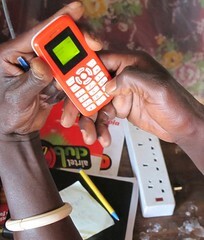 The vouchers were given out as part of the community-based marketing effort and enabled mothers to try the kit for the first time at no cost without undermining the value chain. Retailers redeem the vouchers using their phones and the full recommended retail price is deposited in their mobile money accounts. We will assess the viability of this approach in our midline evaluation. Vouchers were certainly an effective launch tool but we are likely to modify our approach in a scale-up. More on this in our midline evaluation. We’ve also used mobiles to provide a system for product authentication and to deliver a special offer voucher to customers’ phones but, in practice, this has received very limited use. Fitting in the Coca-Cola crate has not been important at all. Good old Peter Drucker! You left off building a partnership with a local manufacturer. That was a key innovation too! Because you are not just sourcing product from them….they are creating a product for you. Undertaking stability testing. Changing packaging processes. Taking on kit packing. That requires so much trust and buy-in. They’ve really gone the extra mile. I would be very interested in hearing about other local pharma companies in Africa that have partnered with essential medicines projects to this extent. Pharmanova needs an award from someone! They have been great to work with and perhaps we have taken too much for granted. We’ve never worked with a pharmaceutical partner before. The beauty of this situation it that it bodes well for the future. If (when?) we go to scale-up, it won’t be a question of handing the initiative over to the private sector because key elements are already there.